Hoda Henein is the President and CEO of Active Management, a Practice Management, Consulting, Billing, and Credentialing Company. She carries over 20 years of Billing Management Consultancy experience in the medical field. She is member of AAPC, AMBA, AHIMA, AHLA, HBMA and Cambridge Who's Who; and sits on the Editorial Advisory Board for Podiatry Coding Alerts. Hoda lectures, and offers consulting services and expertise nationwide. Several organizations she has presented for include CHRAA, TPMA, NYSPMA, IPMS, ALPMA, AAPPM, ACFAS, Michigan State Podiatric Society, The Goldfarb Foundation, Chicago IPA, and SOS Healthcare Management Solutions. Russell J. Hornfisher earned a Bachelor's of Science Degree from Central Michigan University, MBA and Master's degree in Organizational Behavior and Development from Eastern Michigan University. He has been an adjunct instructor, teach such subject as Marketing Strategies, Supply Chain Management, and Selling Skills for the Marketing Department in the School of Business at the University of Northern Iowa and Eastern Michigan University. Mr. Hornfisher has published over 40 articles on the topic of selling skills, marketing, and management. He has lectured at state, regional, and national association meetings on topics related to sales, marketing, and management. Russell has spent eight years on the Board of Directors for American Orthotic and Prosthetic Association and six years as chairperson for the AOPA National Assembly. He has served five years in the position as Chairperson of the Marketing Committee for American Board of Certification for Orthotics and Prosthetics. Dennis Janisse is President and CEO of National Pedorthic Services, Inc., a national network of full-service pedorthic facilities with eight locations. In addition to his duties at NPS, Mr. Janisse is a Clinical Assistant Professor in Department of Physical Medicine and Rehabilitation at the Medical College of Wisconsin and Clinical Director of Pedorthics for OHI, Inc. Dennis is presently on the Board of Directors of American Board for Certification in orthotics, prosthetics, and pedorthics. He teaches pedorthics courses at Northwestern University Medical School and the Medical College of Wisconsin. He is past President of the Pedorthic Footwear Association and an honorary member of the American Orthopedic Foot and Ankle Society. He has written extensively on all aspects of pedorthics, with over 50 publications to his credit and has lectured throughout the United States and the world. Jerome S. Klein - C.O., C.Ped. Mr. Klein is an ABC certified orthotist and certified pedorthist who has practiced since 1976. He has lectured at New York University, various PFA symposiums and numerous continuing educational programs. He has given seminars on topics that include bit not limited to Patient Evaluation, Diabetic Foot Disorders, Biomechanics of the Foot and Ankle and Disorders of the Foot and Ankle . Mr. Klein has been a faculty member for The Pre-Certification Course in Pedorthics offered by the Eneslow Pedorthic Institute and leads a prerequisite NCOPE approved program in becoming an ABC Certified Fitter of Therapeutic Shoes. He is on the advisory board of Foot.com, the Pedorthic Newswire and is the Director of Pedorthics at Apex Foot Health Industries, a division of OHI. Dr. Kim Ross received his Ph.D. in Biomechanics from the University of Waterloo in 2003 under the supervision of Dr. S. McGill. Dr. Ross graduated in 1987 from the Canadian Memorial Chiropractic College (C.M.C.C.). Since 1988, he has been teaching chiropractic skills and body biomechanics at C.M.C.C. and current holds the title of Associate Professor. 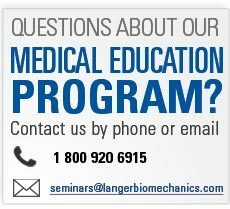 Dr. Ross has lectured in over 50 cities across the globe on foot and body biomechanics including Canada, U.S.A., Ireland, Australia, and Switzerland. Dr. Jonathan Moore received his Doctor of Podiatric Medicine degree from the California College of Podiatric Medicine. He is widely published on numerous foot and ankle related topics and serves on multiple professional boards. In addition to his practice and educational efforts, Dr. Moore also designed and developed the Moore Balance Brace, an innovative custom AFO that stands as the centerpiece in a comprehensive trip & fall prevention program. Dr. Moore currently lectures across the U.S.A. and internationally on a host of topics including Practice Management, Diabetes, Wound Care, and Fall Prevention & Balance. He was recently named as one of Podiatry Management’s most influential podiatric physicians in America.